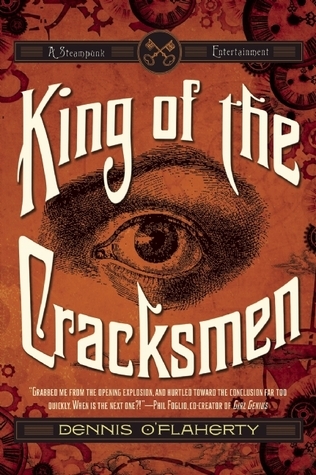 Although billed as a steampunk novel, King of the Cracksmen by Dennis O’Flaherty is more in line with being an Alternative History sci-fi book than a straight up steampunk novel. It is 1877 and Abraham Lincoln is still the U.S. President as he’s never been assassinated. But Lincoln hasn’t been seen for many months, so rumor circulates about what may have happened. The country is being run as a police state by Edward Stanton – a criminal with a lust for power. Among the more common criminals, “The King of the Cracksmen” is an Irish safe-cracker by the name of Liam McCool. McCool’s girlfriend Maggie is murdered and as McCool works to track down her killer, he finds a chain of criminal behavior that extends all the way to Stanton. McCool brings in a lady reporter and tries to bring Stanton down. I have not read a lot of steampunk but I was definitely expecting a little bit more, both ‘punk’ and ‘steam.’ What I got is a story that spends a fair amount of time setting up the world … a world in which the U.S. sold some of its land to Russia and gangs of Mexicans, Russians, and even French, are creating much tension. There are a few steam-applied devices (thanks to Tesla), but overall this feels like an alternate history story rather than a steampunk story. The action moves at a snail’s pace, making room for plenty of world-description. Liam McCool is not a particularly sympathetic or attractive character and it is hard to rally behind him. His actions get lost in the politics of this strange new world and the focus of the book gets muddy. Looking for a good book? King of the Cracksmen is a slowly moving alternative history/steampunk story.